One of my greatest film loves is British cinema. I curse the PAL/NTSC problem everytime I get in a British movie mood (which is almost always.) I adore just about every British star, but my absolute favorites are John Mills (his daughter is Hayley Mills of Disney fame- and my idol when I was a little girl) Trevor Howard, Robert Newton and (I think I have mentioned him before) the wonderful Alastair Sim. And Dame Celia Johnson. Have you seen Brief Encounter? It has to be one of the best movies ever made. Whenever I am in a sad funk, I usually take one of two routes in my picture-watching habits. One route is a really happy silly romantic comedy that cheers me up (see: The Awful Truth and Sunday in New York) or I decide to sink deeper into sadness and watch a tearjerker. (see: My Foolish Heart and Brief Encounter) Brief Encounter is the story of two middle class people, each happily married and going about their usual routines--and then they fall in love. It's one of those movies where you are rooting for the illicit lovers to give up their spouses and run away together. (At least that's how I feel-- I also usually root for the gangster and not the 'coppers' in crime movies) One of my favorite things about this movie is Celia Johnson. She didn't actually make too many movies, which is incredibly unfortunate for anyone who enjoys watching good acting. Brief Encounter is the most famous of her films, but I just watched another one recently that was really cute. It's called The Captain's Paradise (it is on DVD) and it stars Alec Guiness, Yvonne DeCarlo (pre-Munsters) and Celia Johnson. The movie itself struck me as a little so-so, but Celia Johnson's performance was stellar. She looks like she's having so much fun in her part, and plays her character perfectly. I was so excited when it premiered on TCM last year. (I didn't know it was on DVD at the time) Celia Johnson only made a handful of movies, and of those only a spoonful are on DVD. For years I've wanted to see The Astonished Heart, but, alas, it is only available in PAL format. The movie was written by and co-stars Noel Coward, one of my favorite playwrights, so I am waiting with baited breath for the day when it is finally released on DVD or played on TCM. I can't wait to see Brief Encounter. It's been on my list of must-sees for a while. Did you draw all of these?? they are really good! come see my blog! Raquelle- you've got to see it now! Make it the next movie you watch :) By the way I just watched Leave Her to Heaven after reading your post and I loved it! Caroline- I did draw these, thanks :) I'm now going to go look at your blog! 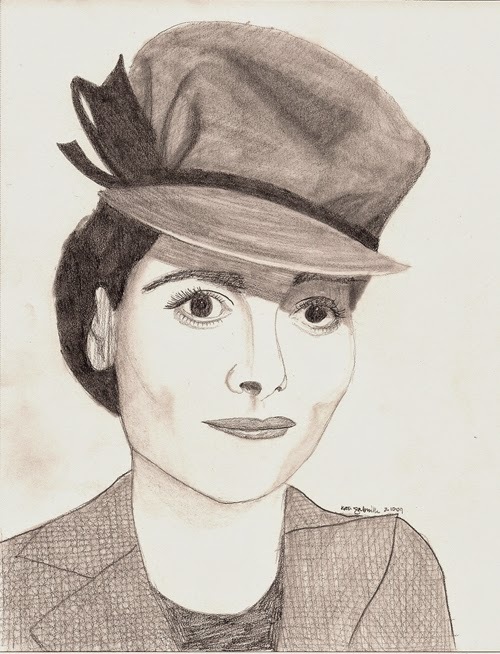 Celia Johnson! I adore her. Brief Encounter is such a lovely film. Even though it is supposed to be sad, I can never really feel like it's sad. (if that makes sense...) I root for them to leave their marriages, too. I feel guilty, but they are so happy together! It's the film that made me fall in love with Trevor Howard. I'm so glad it did, because he made some fabulous films, too! I'm totally shocked that Raquelle hasn't seen BE and I agree w/ you Kate, she must - right now! Hmm... I wonder why it won't work in Firefox. I use IE and I know that I always have to try commenting twice, because it always fails the first time (It just did... request cannot be processed). I wonder why it's just my blog? I love Celia Johnson as well! Have you seen "This Happy Breed" yet? She's marvelous in that. She also has a role in David Lean's first movie, "In Which We Serve," another movie worth seeking out. These drawings are great! I'll be sure to link to your blog and check back for more updates. I've seen them both and love them, especially This Happy Breed. I think of it as the British version of Meet Me in St. Louis for some reason... quintessentially British. I really wish she made more movies, don't you? It's not just your blog, Kate. I read another blog that uses this same widget (?) for commenting and Firefox doesn't like that one either. When I use IE, I have to process it twice, too. If you get a choice of comment methods, you could try switching to another and see what happens.